In need of a towing service in Romulus? Goch & Sons is here to help! 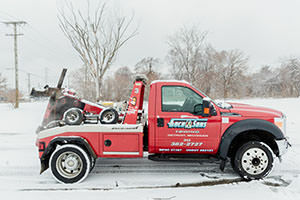 We are the best nearby towing service available. We understand how frustrating it can be when your car has broken down. So if your car becomes disabled, rest assured Goch Towing is nearby. Even if you’re not in Romulus – if you’re just looking for a “tow truck near me” – call Goch & Sons! Our towing services and roadside assistance are available 24 hours a day. 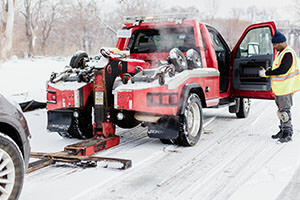 Goch & Sons offers professional towing service in Romulus. Car troubles? Car accident? Just need jump? We can help. Goch Towing is equipped for all types of emergencies. We’ll provide prompt and dependable towing services, emergency roadside assistance, and even long-haul transportation services if you need it. Whether you’re out of gas or need more advanced roadside assistance – Goch Towing is ready for your call. We’re conveniently located to Metro airport if your car is stuck there – so you can be confident that we can be there quickly. Call us at (313) 382-2727. Auto Accident in Romulus? Call Goch! After you call us, Goch Towing will dispatch a tow truck to your location quickly. We’ll get the job done – whether you need a flatbed truck or heavy-duty tow – we’ve got the equipment for the job. Our tow truck drivers are all properly trained and certified, so they can handle the stickiest jobs in a professional manner. And our drivers have experience towing everything from sedans to school buses – so whatever you need assistance with – we’ve got you covered. Flat tire? Out of gas? If you find yourself on the side of the road for any reason help is nearby. Request our fast and friendly towing service by giving us a call. Goch tow trucks are on standby, waiting to help 24 hours a day, 7 days a week. Goch Towing will arrive at your location and get to work. We’ll tow your car to a repair shop, your home, or wherever you need it. We want to make sure there’s no stress, no hassle, no problems. We know you take pride in your vehicle, that’s why our professionals adhere to every safety measure to ensure your car is not damaged during transport. We’ll take care of your car, and the job will still be done efficiently and quickly. We’ll even send a flatbed tow truck out to your location. Goch & Sons have provided wrecker services to Romulus residential and commercial customers for decades. We’re fully licensed and insured, we deliver damage-free towing and hauling services all over Southeast Michigan – and beyond. We’re fast, too. In any kind of roadside emergency – if you need roadside assistance, we’ll get a driver dispatched within minutes of your call. Whether you’ve been in an accident, are having car trouble or are need a car moved from point A to point B – we’ll get your car where you need to be. Get the quality service you expect when you choose our professional towing company. If you’re in Romulus – you’re probably going to, or coming from, Detroit’s Metro Airport. That’s probably the worst time you could experience a break-down. Get back on the road fast and call Goch! If you’re searching for a quality local tow truck company that always provides a quick response towing and roadside assistance – call Goch & Sons Towing at (313) 382-2727. We not only serve Romulus – but also the whole metro Detroit area. Goch & Son’s Towing offers 24 hour roadside assistance and towing. Our seasoned professionals will get to you as quickly as possible, dealing with the problem and working along with you to get your vehicle running once again. We greet our customers with courteous, uniformed individuals so you feel safe when you need roadside assistance. All of our professionals offer excellent customer service and will work hard to make you feel comfortable as they work to get you going. We have experienced, well trained operators that you can trust. If we are unable to get your vehicle moving again, we also offer towing services to get your vehicle home or to a local shop for repairs. Our operators take the utmost care with your vehicle to ensure it arrives at its destination safely. No one wants to be left alongside the road with a vehicle problem, but when it does happen, you want to be able to call someone that you can trust. Goch & Son’s Towing offers the roadside assistance and towing services you need, providing 24 hour, reliable service that is there for you any time you need it.